Reaper of Souls Release Day! 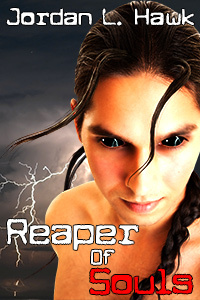 It’s release day for Reaper of Souls, the third novella in my SPECTR series. When an incubus murders the powerful ally of an anti-paranormal senator, it’s up to hotshot Federal agent John Starkweather to catch the demon before it can kill again. Fortunately, he has backup, in the form of his boyfriend Caleb, a telekinetic possessed by the vampire spirit Gray. As the political pressure mounts and bodies pile up, John discovers an old enemy protecting the incubus: the Fist of God, a group that believes all paranormals are evil. But why would the Fist work with a demon? And why would they let it kill one of their own allies? John and Caleb need to find out fast. Because the incubus lurks at the intersection of love and longing, and it’s willing to turn their deepest desires against them. Haven’t started the SPECTR series yet? Hunter of Demons is now only $0.99 on Amazon, B&N, ARe, Kobo, and Smashwords! YAY I am so excited for you!! !